Abigail Abbott (Loretta Young), a widow raising a college-aged daughter (Betty Lynn), has run into some serious financial trouble. Things have become so serious that the younger Abbott, Susan, may have to drop out of school. There’s a solution to be found, though. By using her maiden name of Fortitude, Abigail is eligible for a scholarship set up by one of her ancestors, which is only available to women named “Abigail Fortitude.” Abby heads to the same college as Susan in order to get the scholarship money, which will tide them over until they’re able to gain access to the family trust. They decide to hide the fact that they’re mother and daughter from just about everyone on campus, and things get complicated when Abby becomes very popular — especially with Susan’s favorite professor (Van Johnson). 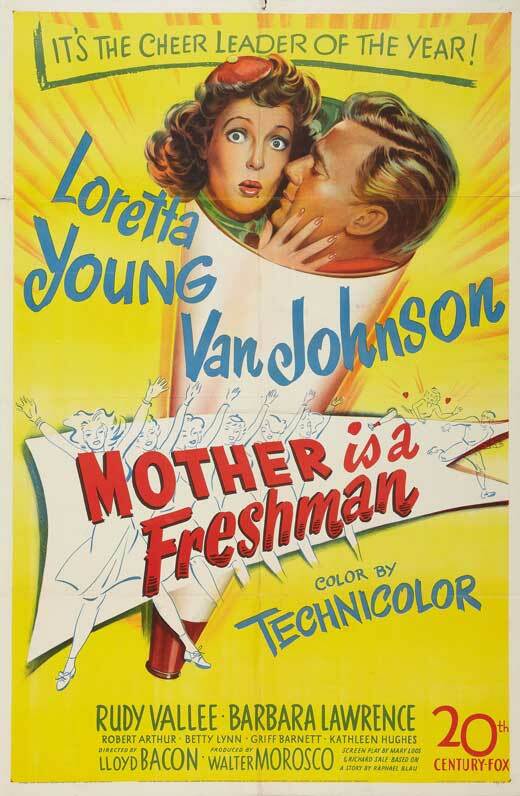 Mother is a Freshman was directed by Lloyd Bacon. At times amusing, Mother is a Freshman is also at times quite dull. 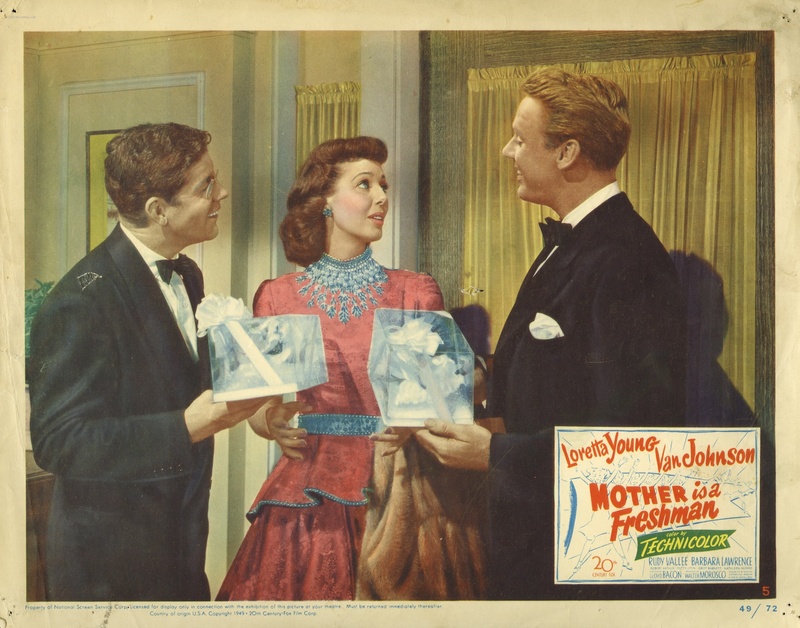 The pace is fairly slow, and though Loretta Young puts a lot of effort into creating emotional depth in her character, she isn’t able to work magic on the weaker points of the film. While all of the performances are decent, the cast doesn’t mesh together particularly well, which drains some of the vibrancy that could otherwise have been found in the film. I also loved seeing the “old ways” of the college’s operation, like in-person registration. By the time I reached college, online registration had already been implemented. Rather than standing in line for hours and writing my chosen courses on a card, I woke up each registration day, turned on my laptop, and searched the online catalog for my classes. It was interesting for me to see how campus life has – and, in other cases, hasn’t – changed! As an added element, Abigail and her daughter find themselves involved in a love triangle when they both fall for the same charming English professor. While this seems like a fairly standard twist, this subplot ends up being more engrossing than expected, thanks in large part to Loretta Young’s performance. She portrays a real sense of caring and concern for her on-screen daughter. Speaking of which, the mother/daughter dynamic (both on campus and prior to Abigail’s enrollment) is another positive aspect of the film. They’re clearly very close and fond of each other, but their generational gap leads to a few problems. (In one scene, daughter Susan tells her mother that her life is practically over, as though she’s in her 90s!) They’re more alike than they realize, which they seem to understand by the end of the film.